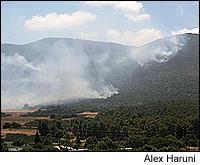 Vineyards in the Galilee are being shelled regularly. As a winemaker in Israel, Micha Vaadia is used to surrealism. Last year he recalls staring out of the window at Galil Mountain winery in Upper Galilee, about 200 yards from the Lebanese border, and seeing heavily armed Hezbollah fighters sitting in their outpost, staring back. "In this part of the world, the unknown is larger than the known," said Vaadia. "The Hezbollah never worried me too much, because there is a good karma about wine." That good wine karma came to a crashing end for Vaadia three weeks ago, when "swarms of Israeli paratroopers and infantry" took up positions in and around his vineyards. Then tanks rolled up next to the Pinot Noir and let rip, destroying the outpost and possibly taking Galil Mountain's chance of a decent 2006 harvest with it. The wine industries of northern Israel and southern Lebanon have come to a grinding halt since July 12, when Israel began an all-out assault on Hezbollah after it fired rockets into Israel from southern Lebanon and captured two Israeli soldiers in a raid. While the two countries' wines don't have a huge presence in the U.S. market, the industry is substantial there. Israel has more than 100 wineries in five regions, the most prominent being the Galilee, which has roughly half of Israel's producers in an area covering the north of Israel along the Lebanese border, extending down into the Golan Heights. Lebanon has seven wineries, all located in the Bekaa, the 75-mile long and 10-mile-wide valley running along the eastern side of the country. "The tanks like the wide roads, level ground and good cover a vineyard has to offer," explained Alex Haruni, owner of Dalton Winery, also located in the Galilee. Haruni added that Hezbollah typically retaliates by lobbing Katyusha rockets back into the vineyards. Dalton's property is in the line of fire, making it too dangerous to work on the vines. Luckily for Vaadia, the Israeli army has cleared Hezbollah from the area around his vineyards. However, it remains too dangerous to venture out there for preharvest prep work. "We will need to harvest in mid-August, if this thing ends by then," he said. "I remain optimistic that it will, and we will be all right for 2006." Haruni is not nearly as lucky. The Israeli army has not cleared Hezbollah from their positions across the border, a little more than a mile away from his winery. "We are getting constantly shelled. My staff hasn't slept for two weeks," he said. "We haven't sprayed, trimmed or fine-tuned any of the grapes before harvest. It has been a very, very difficult month." Haruni added that Dalton had recently opened a visitor's center, complete with free shuttle service from local hotels, as tourism in Galilee was booming. The center was generating $50,000 in revenue each month, which Haruni used to pay the salaries of his 13-member staff. Now he bitterly jokes that it doesn't matter if he can't pay his workers, since there is little work for them to do. Another major obstacle facing Haruni is the fact that he can't gain safe access to his bottling facility during the conflict. Many of his storage tanks are still full with wine from the 2005 vintage and, even if he can pick the grapes this year, he'll have few places to ferment and store the wine. Shai Ghermezian, executive vice president of Allied Imports in New York (which represents Dalton and three other brands), said he's not sure he'll be able to get Dalton's wines to the U.S. in time for Rosh Hashanah. Illi Adato, who runs Wine.Is, an importer of Israeli wines to the United Kingdom, said his shipments are massively delayed and arrangements need to be made to move the wine to Israel's only other port, in Ashdod, about 15 miles south of Tel Aviv. "By the time it gets there, [the port] is so congested you cannot even get a schedule for shipment, so things are pretty bad," he said. Similarly, Paul Chidiaz, a spokesman for Bekaa Wines, the leading British importer for Lebanese wines, representing wineries such as Château Musar, Château Kefraya and Château Nakad, said his shipments have been postponed for at least three more months. "Right now, you never know what's going on over there," Chidiaz said. "Winemakers are in their bunkers as Hezbollah rides around the vineyards, hiding behind the wineries, launching rockets into Israel. Then, four or five minutes later, Israeli jets come in and start bombing the area." According to Chidiaz, at Domaine Wardy, in the Bekaa, Israeli jets destroyed a plot of Chardonnay. Workers are now too afraid to go into the fields, as the jets "could target anything that's moving," he said. Chidiaz said that the best-case scenario would be that business would return to normal in time for the 2007 harvest. Haruni's feelings for the future are more uncertain, however. "Hezbollah just points their rockets in our general direction and hopes for the best," he said. "It's a tool of terror, of complete mayhem, and until the Israeli army does what it says it wants to do, that is cleanse Lebanon of Hezbollah, you will still have this feeling that you're right in the line of fire."